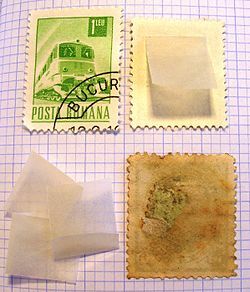 In philately, stamp hinges, or mounts, are small, folded, transparent, rectangular pieces of paper coated with a mild gum. They were used by stamp collectors to affix postage stamps onto the pages of a stamp album. Collectors now use different methods to store their stamps. A hinged stamp have a highly reduced value (up to 50%). Never hinged stamps doesn't have any hinge mark on reverse. Light hinge mark on reverse. HEavy hinge mark on reverse. Part of a hinge mark on reverse. The gum on reverse is damaged by something else than a hinge (ex. : La gomme au verson a été endommagée par autre chose qu'une charnière (ex. : fingerprint). Since the time that unhinged stamps became popular, considerable numbers of old stamps with intact gum have appeared on the market, raising suspicion that many of these have been regummed. Part of the gum is missing due to an error during the production process. The original condition of the stamp.